If there's one thing that kids and parents can agree on, it's that no one likes being told what not to do. Don't splash, don't play with your food, don't underfund your 401-K, it's all just a drag. This is a message that we at the American Academy of Pediatrics (AAP) have heard loud and clear, especially when it comes to kids and technology. "Don't let your child watch television. Don't give your baby an iPhone." Parents respond, "I'd love to listen to you, but I'm busy right now funding my 401-K. And playing with my food." That's why our newer media guidelines focus much less on what parents should avoid than on what they should encourage. Do co-view programs with your children. Do read up on apps and games your kids might use. Do have a family conversation about where media fits into your lives and how you're going to make time for other activities. If there is one overarching "do" on the list, it's do make mindful choices about technology use and your children. Will handing your toddler an iPhone while you pay for groceries permanently stunt her development? Probably not, but be aware that new research further reinforces the relationship between media use in young children and delayed learning of language skills. It's not like it happens instantly, but if you find that you can't go to the grocery store without handing her a phone, it's time to reconsider. Likewise, if you're going to acquire a new device for one of your children — be it a smartphone, a tablet, or a gaming system — ask yourself ahead of time what the purpose of this device is and what rules you want to establish around its use. The AAP suggests, for example, that devices not come to the dinner table or stay in kids' bedrooms overnight. Kids do need conversation around the dinner table, and they do need a solid night's sleep to be at their best. 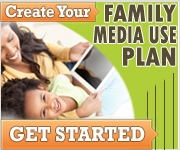 An easy way to structure this conversation is to use the AAP's Family Media Use​ Plan tool​. As your kids grow older their needs change, as do your family's. A laptop that may have previously been used primarily for Minecraft becomes a mandatory tool for completing homework assignments. A social network that was mainly for posting funny pictures becomes the main tool for planning nights out and keeping track of who said what to whom during the school day. At this point do take time to ask what's happening online. For our kids, the online world and the "real" world are all the same thing. Even an activity as pointless-seeming as a video game often brings our kids together with their school friends to form online teams, where the dynamics of the lunchroom and the playground continue to play out on a strategic map running on a server farm somewhere in the desert. So do ask questions. Do feel empowered to structure rules around media use, just as you would about food, safety, and sleep. And do occasionally play with your food. You're a grown up, who's going to stop you? Editor's Note: This article originally appeared on Keeping Tech in Check, Cricket Media's new web hub designed to provide families with the resources they need to balance technology in their households. © 2017 Cricket Media, Inc. Used with permission.